Army Major Robert Kilmartin joined the U.S. Military because he felt a greater purpose to serve America, and felt it was his patriotic duty. His grandfather served in World War II and earned the Distinguished Flying Cross (4x) and the Air Medal (6x). Major Kilmartin’s stepfather was also a major influence in his life, having served over 30 years in the Army. Major Kilmartin joined the Army in Springfield, Massachusetts in December of 1994. He enlisted as a private at the age 18, and, after being promoted to Staff Sergeant and attending Officer Candidate School, he was commissioned as a 2nd Lieutenant. All the while, he was attending college (summer and night classes) and he earned his degree from the University of Connecticut. Major Kilmartin served in numerous capacities over the next decade, with both conventional and unconventional Special Operations Forces, to include overseas deployment to Kuwait, Iraq, in positions as Company Commander and Observer Controller/ Trainer Team Chief. He joined the 3rd BDE 10th Mountain Division in the Zharay district of Kandahar, Afghanistan. On December 29, 2011, he was a Civil Affairs Team Leader on a dismounted patrol near Bareckzi, Afghanistan, when his element encountered direct small arms fire after discovering an improvised explosive device (IED). The IED exploded less than 10 meters away from Major Kilmartin. He was tossed into a dirt wall, injuring his neck, back, shoulder, and knees. The shockwaves from the blast caused a concussive head injury, and left him in a state of confusion for several hours as he continued with the mission. His unit took on small arms fire for several hours throughout the afternoon as they returned to the Combat Post. 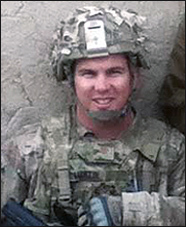 Major Kilmartin received treatment for a concussion and a mild traumatic brain injury. An MRI showed degenerative disc disease of the spine and neck, herniated and bulging discs, and protrusions in the neck and back, shoulder damage, and injuries to his legs. As a result of the injuries he sustained, he received the Purple Heart. Months later, while with the 4th BDE, 82nd Airborne Division, he was part of a vehicular convoy near Besmellah, Afghanistan, when the lead vehicle hit an IED. Major Kilmartin's head violently smacked against the seat back and into the passenger side window. Despite the fact that he was wearing a helmet, it caused a concussion, resulting in confusion, dizziness, and anterograde amnesia that lasted several hours. The convoy was able to recover the destroyed vehicle and continue the mission before returning to the Forward Operating Base. He received treatment for a concussion and mild traumatic brain injury. He spent two weeks at the TBI clinic. Major Kilmartin was awarded his second Purple Heart. After this, he continued to patrol the villages of Afghanistan. In all, he completed more than 200 dismounted combat patrols, and was involved in more than 100 situations that involved IED blasts. In addition to the Purple Heart medals, Major Kilmartin earned the Bronze Star Medal, Meritorious Service Medal, Army Commendation Medal (3x), Army Achievement Medal (3x), National Defense Service Medal with Bronze Star Device, Afghan Campaign Medal with Bronze Star Device, Iraqi Campaign Medal with Bronze Star Device, Combat Action Badge, Australian Defense Commendation Medal, and numerous other awards and commendations. Building Homes for Heroes gifted Major Kilmartin, his wife Christina, and their four children a home in Riverview, Florida in September of 2014.